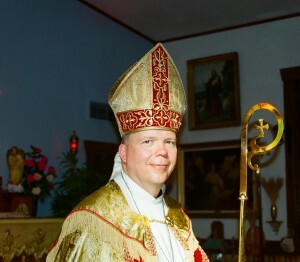 Bishop Jürgen was born on April 17, 1963 in Hagen/Westphalia, Germany, where he was baptized on June 16, 1963 and grew up. He was confirmed on May 23, 1976 at the Johanniskirche in Iserlohn/Germany where his parents and his two sisters still live. Fr. Jürgen holds dual citizenship, Canadian and German. He studied theology in Germany at the University of Heidelberg, and the Kirchliche Hochschule Wuppertal, and in the USA at Luther Seminary in St. Paul, Minnesota. In Heidelberg he was a member of the local Old Catholic Church. He graduated from Luther Seminary in St. Paul with a Master of Divinity in 1991. He went for his first call to the German United Church of Christ in Seattle, Washington, where he was ordained on September 21, 1991 into the United Church of Christ. The late Rev. Carl Mau – former General Secretary of the Lutheran World Federation with 54 Million members – was a principal ordinator. He did some further studies in clinical counselling in Seattle and completed a unit of 400 hours of Clinical Pastoral Education. He accepted a call to Vancouver, BC and was ordained into the Evangelical Lutheran Church in Canada on February 15, 1993, at Martin Luther Church by Bishop Marlin Aadland. He was ordained Deacon in the Old Catholic Church of B.C. on August 20, 1995 and on October 27, 1996 to the Holy Priesthood – both ordinations by the +Rt. Rev. Gérard LaPlante at St. Raphael’s Old Catholic Church in Vancouver, BC. He was consecrated Bishop for The Old Catholic Church of BC by the Rt. Rev. J. Gérard LaPlante, assisted by the Most Rev. Hilario Cisneros on June 3, 2007 at St. Raphael’s Old Catholic Church in Vancouver, BC.